Friends of the Soldiers Home volunteers cooked delicious hot dogs and greeted supporters at their spring fundraiser held outside Annie’s Hardware on Saturday, April 26. The talk at the event centered on Spring Fling, as the free outdoor festival on the grounds of the Armed Forces Retirement Home will be held exactly one week after the fundraiser. Some people who were at Annie’s to buy some hardware stopped to visit, donate and learn about the volunteer work that the Friends do at the Soldiers Home. Finally, at 3pm when all the hot dogs were sold out, it came time for Annie’s Hardware owner Anne Stom to temporarily leave her busy post at the store’s main cash register and come outside for the big drawing. 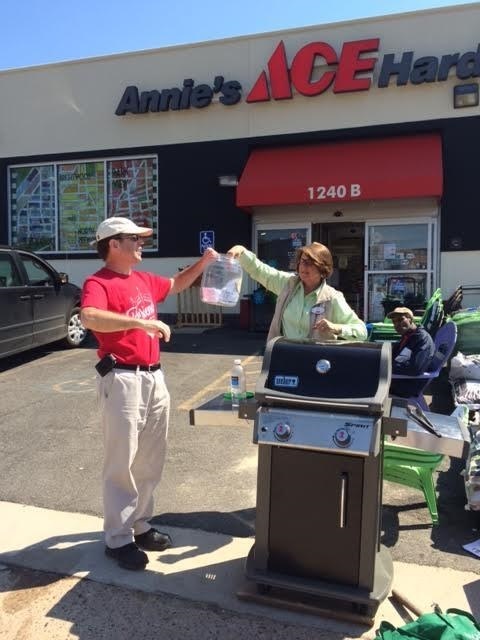 Anne donated a Weber gas grill that retails for $399 that would be raffled off to a lucky winner. Of course it was only appropriate that Anne herself would reach into the large plastic bin and determine who would soon be grilling in style. The lucky winner was Constance Durham, who earlier in the day was kind enough to “take a chance” and help Friends of the Soldiers Home. When Constance was reached after the drawing, she said she was stunned, and that she hadn’t won anything before. She promptly came down to the store and picked up her beautiful grill. Anne said Constance was ecstatic. We want to thank all of our friends and supporters for making the trip down to Annie’s to support our work. We’d also like to thank Annie’s customers who perhaps weren’t planning to donate to a worthy cause when they headed to the store Saturday but took time to show their support. Above all we’d like to thank Anne Stom, who has supported Friends of the Soldiers Home since the very beginning and has shown over and over again how she cares about veterans and her community. If you weren’t able to come to Annie’s but would still like to show your support, go to friendsofsoldiers.org and click on the “donate” button. Now that some of the hard work is out of the way, we hope to see you for some fun at Spring Fling on May 3! Photo caption: Anne Stom, owner of Annie’s Hardware, reaches in the bin to pick a winner for the raffle of a $399 Weber gas grill at the Friends Spring Fundraiser April 26. Friends President John Hughes holds the bin while Friends Board Member Timothy Jones, right, looks on.